Featured image: “Hannah Duston Killing the Indians” by Junius Brutus Stearns, (1847); Colby College Museum of Art, Waterville Maine. Hannah Duston of Haverhill was born in Ipswich on High Street in 1657 while her mother was visiting her relatives the Shatswells. 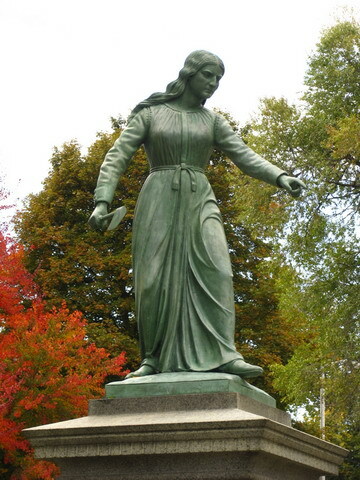 In 1879, a bronze statue of Hannah Duston was created by Calvin Weeks in Haverhill in Grand Army Park, honoring her escape from Abanaki captors. The following are excerpts from an article by H.D. Kilgore in 1940. Statue honoring Hannah Duston in Haverhill. Duston is the first American woman honored with a statue. “On March 14, 1697 Hannah Duston was living with her husband Thomas in a house on the west side of the Sawmill River in Haverhill. Under the care of Mrs. Mary Neff, both mother and child were doing well. Thomas, like all good farmers, had risen and was at work near the house, attending to the morning chores, when he suddenly spied a band of approaching Indians. Instantly seizing his gun, he mounted his horse and raced for the house, shouting a warning which started the children toward the garrison, while he dashed into the house hoping to save his wife and baby. Quickly realizing that this was impossible, and urged by Hannah, he rode after the children. A few of the Indians had pursued the little band of fugitives, firing at them from behind trees and boulders, but Thomas, dismounting, and guarding the rear from behind his horse, held back the savages by threatening to shoot whenever one of them exposed himself. Meanwhile, a fearful scene was being enacted in the home. Mrs. Neff, trying to escape with the baby, was easily captured. Invading the house, the savages forced Hannah to rise and dress herself. Sitting despairingly in the chimney, she watched them rifle the house of all they could carry away, and was then dragged outside while they fired the house, in her haste forgetting one shoe. A few of the Indians then dragged Hannah and Mrs. Neff, who carried the baby, towards the woods, while the rest of the band, rejoined by those who had been in the village, killing twenty-seven and capturing thirteen of the inhabitants. Finding that carrying the baby was making it hard for Mrs. Neff to keep up, one of the Indians seized from her, and before its mother’s horrified eyes dashed out its brains against an apple tree. Fearing a prompt pursuit, the Indians immediately set out for Canada with their booty. Some of the weaker captives were callously knocked on the head and scalped, but in spite of her condition, poorly clad, and partly shod, Hannah, doubtless assisted by Mrs. Neff, managed to keep up, and by her own account marched that day “about a dozen miles”, truly a remarkable feat. During the next few days they traveled about a hundred miles through the unbroken wilderness. After reaching the island, the Indians grew careless. The river was in flood. Samuel was considered one of the family, and the two women were considered too worn out to attempt escape, so no watch was set that night and the Indians slept soundly. Hannah had decided that the time had come. Shortly after midnight she woke Mrs. Neff and Samuel. Each, armed with a tomahawk, crept silently to a position near the heads of the the sleeping Indians – Samuel near Bampico and Hannah near her master. At a signal for Hannah the tomahawks fell, and so swiftly and surely did they perform their work of destruction that ten of the twelve Indians were killed outright, only town – a severely wounded squaw and a boy whom they had intended to take captive – escaping into the woods. 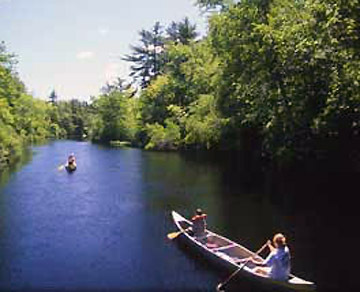 Hastily piling food and weapons into a canoe, including the gun of Hannah’s late master and the tomahawk with which she had killed him, they scuttled the rest of the canoes and set out down the Merrimack River.